SUE Solutions successfully completed the Phase I Quality Level ‘B’ utility designating services for the US-89, Passing Lanes and Improve Alton Intersection project located in Kane County, Utah, for Civil Science and UDOT Region 4. SUE Solutions contracted with Civil Science to perform the utility investigation tasks on this project. The project includes three (3) distinct roadway segments along US-89, each being approximately 1.5 miles in length. The project is to include the addition of passing lanes within each of the segments as well as intersection improvements to the Alton intersection. The Phase I designating services were completed in December of 2012. Due to the length of the project, SUE Solutions approached the project with the goal of identifying utilities with completeness, while also considering associated costs. 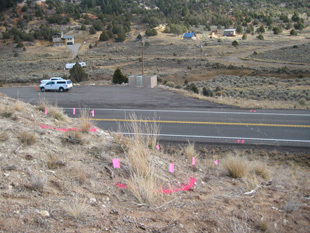 SUE Solutions established a program of designating the utilities in intervals (a 100 foot cross-section of utilities were located every 500 feet). This allowed SUE Solutions to provide the most comprehensive utility information while meeting the projects design and budgetary goals. 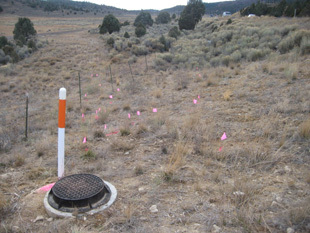 Approximately 9,500 lineal feet of existing underground utilities were designated, surveyed, and mapped (CAD) to Quality Level B standards and specifications, and an additional 30,000 lineal feet were mapped to Quality Level D standards and specifications. Eleven Quality Level A test holes have been included within the SUE scope of work and will performed at some point in the future. Utility coordination efforts with existing utility owners also took place to account for those utilities that were not locatable by conventional means. SUE Solutions designated the following utilities: culinary water, phone, fiber optics, and electrical. SUE Solutions was able to locate these utilities ahead of schedule and under budget. The final deliverable to the Design Consultant consisted of a Phase I comprehensive SUE report which contained existing utility conditions and their limitations, photographs of designated utilities, survey data, CAD files, and existing utility owner mapping.